Medical Marijuana Use Sprouting In Israel Since 2005, medical marijuana use in Israel has grown from a few hundred government-licensed users to more than 10,000. The demand for cannabis, prescribed to treat ailments such as cancer and chronic pain, has created a smoking new market. But the new venture is not without its critics. 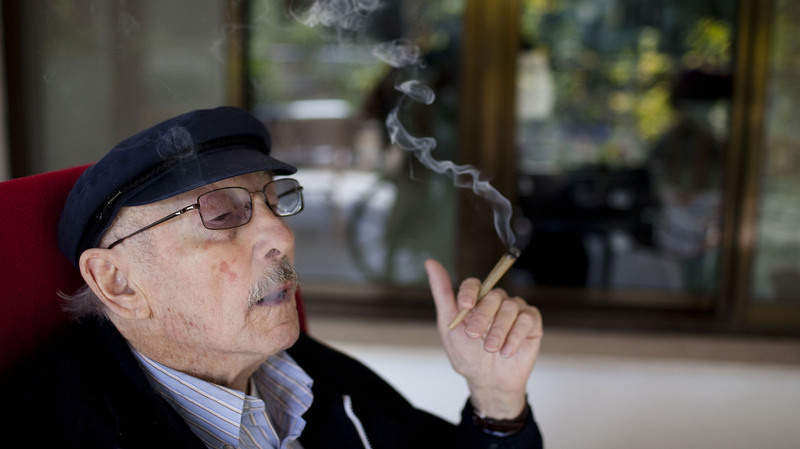 Moshe Rute smokes cannabis at the Hadarim nursing home in Kibutz Naan, Israel. In conjunction with Israel's Health Ministry, the Tikkun Olam company is distributing cannabis for medicinal purposes to more than 1,800 people in Israel. 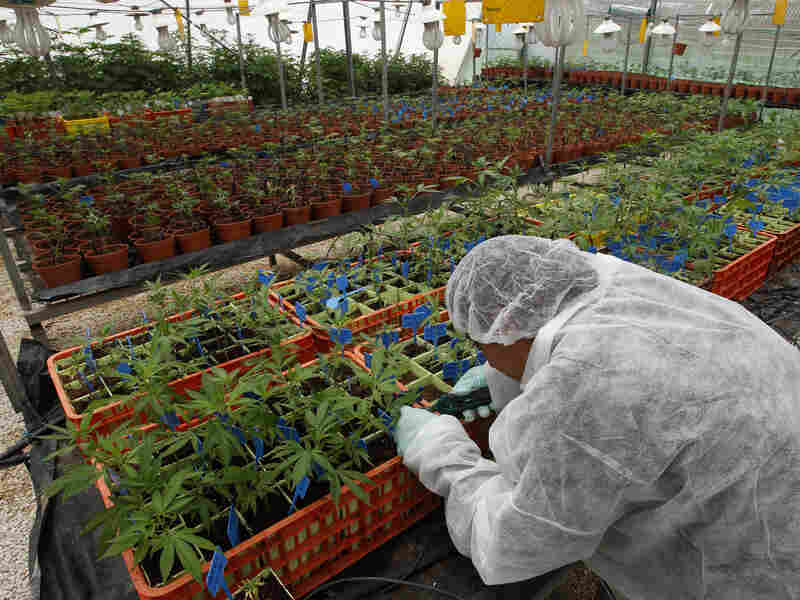 Israel has become a world leader in the use of medical marijuana. More than 10,000 patients have received government licenses to consume the drug to treat ailments such as cancer and chronic pain. "It's not like we're kids and we're getting high and going out and partying. You take it, you're by yourself usually, you just do it because you want to be in a better place. You don't want to sit and stew in the pain," says Malkah, who has been using cannabis for about two years. "It's natural, it helps, you don't have to fill your body full of chemicals. It's terrific." More importantly, its use for medical purposes is legal in Israel. Malkah and other registered patients are being prescribed cannabis at the premier medical facility in a country known for its advanced medical care. That's because many of the head doctors at Jerusalem's Hadassah Medical Center are touting its use. Dr. Reuven Or, director of the hospital's bone marrow transplantation department, says Israel was a pioneer in medical marijuana research and quickly saw and began to apply the benefits. Cannabis not only allows patients to regain their appetite, fight nausea and relax, but it's also proven to be an anti-inflammatory. According to Or, medical marijuana use first began in the bone marrow transplant cancer ward. "We started to use it as a routine treatment as part of all the other medications that we give. Slowly we enlarged the use to other cancer patients. We opened here a center that can help patients who are not hospitalized, from outpatients," Or says. Eventually the Ministry of Health got on board, he says. Now, not only are cancer patients entitled to use medical marijuana, but people suffering from an entire list of other ailments including some psychological problems such as post-traumatic stress disorder are able to take advantage of its benefits. A worker tends to cannabis plants at a plantation in northern Israel. Researchers say they have developed marijuana that can be used to ease the symptoms of some ailments without getting patients high. "We see many beneficial effects from the medical cannabis and therefore we are very open to use it," Or says. In Israel, the Ministry of Health approves people for medical marijuana use with a recommendation from a doctor. After they get the license, the patient can either have it administered in a center, like the one at Hadassah Medical Center, or the drug can be given at home through one of about a dozen registered companies. And its use has swelled in recent years. There were only a few hundred users in 2005, now there are more than 10,000 licensees. But not everyone is happy about that. "People are waiting to see me now for six months," says Dr. Elyad Davidson, director of the pain relief unit in Haddassah. "I'm dealing so much with people who are waiting for the cannabis or on the cannabis list that it's not letting me treat the general population. So it's absurd in some ways." Davidson says most patients who receive licenses are using cannabis to manage chronic pain. But he warns medical marijuana is not a miracle cure. "We need more research and more knowledge [of] when to use cannabis for medical disorders and when not to use. We need to know that cannabis does have its problems, the public needs to know," he says. Davidson says because it's a so-called "natural" drug that is grown and not fabricated in a lab, it's hard to control the quality of what a patient is getting and it's hard to know, as a doctor, how much a patient should be using. He says there needs to be more oversight and regulation. "I would like to see cannabis as like any of my other medications. It's a new class of medicine, for me that's good, I'm happy about that, but it needs to be dealt in all the aspects like any other medicine," he says. But even medical warnings haven't stopped people from trying something that might alleviate the effects of their illness. Back at the medical marijuana clinic, cancer patient Natalie Badwig is trying to incorporate medical marijuana into her life. "Because of my weight loss, which has been quite drastic," Badwig says. "So the doctor suggested that I, you know, try cannabis and so I did." She's hoping it will help her where nothing else has.